A flashpoint in the play-off match between Eye United (green) and Bretton North End. Photo: David Lowndes. Bretton North End’s third successive Peterborough League promotion is in doubt after they were accused of fielding an ineligible player. 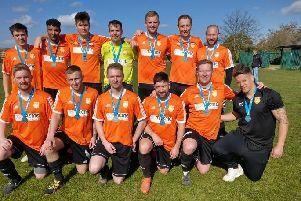 The city side thought they had won promotion to Division Two after beating Eye United 5-0 in a promotion play-off match last night (May 17). Action from the play-off match between Eye United (green) and Bretton North End. Photo: David Lowndes. But Bretton fielded Calum Parker in their starting line-up at Lindisfarne Road and it’s understood he did not play enough league games to qualify for a play-off appearance. League rules state eight league games must be played and Parker played just once in the regular season. Eye are unlikely to benefit if the allegation is proven though. They have also been accused of fielding an ineligible player, namely Andrew Buckle who appeared just three times in the regular season. A league disciplinary panel will decide on both teams’ fate early next week. Bretton are thought to have requested to appear before that panel. It’s likely Stamford Lions Reserves will be promoted from Division Three alongside Tydd St Mary who beat them 4-1 in their play-off clash last night. If Bretton are punished it will be harsh on Fernand Bass who scored a hat-trick against Eye. Kenny Martin and Arfan Arif also scored. Scorers for Tydd, who finished seven points behind third-placed Lions, were Maxwell Burrell, Timothy Lowe, Andrew Cook and Scott Pemberton. Because of the re-structuring of the league there was no need for a play-off final at Division Three level. That’s not the case in Division Two where Spalding Town won a tense semi-final on penalties against Ketton Reserves after a 1-1 draw. Spalding now take on Peterborough Polonia in the final at Yaxley FC on Saturday (May 21, 2pm). Polonia received a bye to the final as Whittlesey Athletic A, who finished in a play-off place, cannot be promoted as the club’s B team is already in Division One. Scott Burrell fired Spalding ahead last night before Ketton equalised in the second half. (Spalding won 4-3 on penalties). Bretton North End 5 (Bass 3, Martin, Araf). Tydd St Mary 4 (Lowe, Burrell, Cook, Pemberton).